A "Basic Strategy Card" is a reference card that helps twenty-one players make optimal decisions while playing using basic strategy. Cards are typically easy to read tables that tell a player if it is best to hit, stand, split, double down or surrender for every possible hand combination. Laminated strategy cards can be found and purchased in many casino gift shops, or our cards be printed for free from your computer. The vast majority of casinos allow players to reference a card while playing, but if you are unsure you should consult your dealer. A dealer's upcard is listed along the top row. A players hand is listed in the left column showing hard hand totals, soft hand totals, and splittable hands. 1) find the intersection between your hand and the dealers card. 2) Decipher the entry using the key. 3) Follow the recommended action. Blackjack is played in casinos all over the world and ther are hundred of possible game variations. These printable basic strategy cards should cover the vast majority of twenty-one games. Not sure about a particular rule or game variation? Ask about it in ourSide Bets and Game Variations forum. Grand Parker Casino is a newer online casino recently established to help serve the needs of USA players. The casino is licensed in Curacao, runs on the trusted Realtime Gaming software, and is audited by Technical Systems Testing. The Downloadable client is fast, user friendly, and very secure. - Grand Parker is powered by RTG (Real Time Gaming) Software, a well known and trusted company in online gaming that is known for their fair and frequently tested random number generators. Grand Parker is also regularly audited by TST global to help ensure an additional level of fairness. - Grand Parker Casino has a Diverse selection of Table game including 7 Variants of Blackjack, American and European Roulette, Craps, Sic Bo, Baccarat, various pokers, and more. If Slots and Video Poker are your thing, Grand Parker Casino has the full complement of RTG slot games. You have over of 100 slots games to choose from ranging from classic 3-reel and 5-reel slots, progressive slots, and games with bonus rounds, all in a wide variety of fun themes. Video Poker players have over 20 variants to choose from. - Deposits are quick and easy. The Grand Parker Casino cashier accepts pretty much all the common deposit methods like Skrill, Moneybookers, ECO Card, as well as all major credit cards. - Cashouts are capped at $3000 per week and can take up to 10 business days. You will get your money, but plan on it taking a little while, especially if you are a high roller. - Deposit Bonuses can’t be used on table games and have playthrough requirements. This is a standard restriction for most online casinos, but first time players should be aware that if they are planning to play table games, don’t accept the bonuses. Who Owns What in Las Vegas? 1) Taking advantage of bonuses is the best ways you can improve your odds in online bingo. Bonuses increase your buying power which allows you to purchase more boards. This can increase your chances of hitting a big jackpot, and let you spend more time playing and socializing if you are on a limited budget. Nearly every online bingo website offers some sort of bonus, so before you deposit make sure you search for best deposit offers you can find so you can play bingo with great bonuses. 2) Only play Bingo at well known and respected online bingo sites. Before depositing any money, do your due diligence and search the internet for a few recent reviews by other players. This helps ensure that you will get paid when you request a withdrawal, and get customer support if you need it. 3) Play bingo with as many cards as you can manage. This increases your chance of winning a particular game. Playing too many cards makes it difficult to keep track of everything and may cause you to miss a winning card or combination, so it is important to not try to overload yourself. 4) Many online bingo sites allow you to change your cards if you don’t like them. Don’t be afraid to take advantage of this if you were given some of your unlucky numbers. 5) Always realize that Bingo is a game of chance. No matter what you do, you cannot influence the numbers that are called. It is easy to get caught up in the emotion of the game, therefore it is important to know your limits and be self-aware of the emotions you are feelings. If you set spending limits ahead of time and stick to them, you won’t fall into the trap of turning an unlucky day into a bad day by chasing your losses with more money than you wanted to spend. The Casino 777 portal at www.777.com is a great place for online casino fans to get the latest online gambling information and news. Visit the portal to read casino game tutorials and reviews. You can even learn about some of the hottest casinos in Vegas and Atlantic city. Casino 777 doesn’t just offer reviews and news. 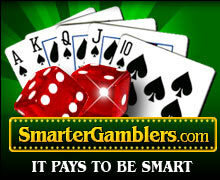 You can also play casino games online for free. If you’d like to play slots, or free blackjack games online, then this is the site for you. 777.com offers tutorials and gaming articles that will help you improve your results at online casinos. Whether you’re a beginner wanting to learn about bankroll management, or a blackjack pro wanting to get an edge you will find something in the articles section. A popular tourist resort in America has received the go ahead to open its own casino, which is to consist of a large number of table casino games. The historic Greenbrier Resort, in Virginia, has only recently received its license, which will allow it to extent its facilities further. It is hoped that the publicity surrounding the new venture will act to bring about a large amount of interest, and that tourists will be eager to go there once the new casino is build and running. The owner of the Greenbrier Resort has paid sixty five thousand dollars for the license, so will clearly be hoping that his investment will pay off. The plans that the Greenbrier Resort has for its new casino development are ambitious. The Greenbrier Resort plans to build a ‘classy casino’, which will attract upmarket classes of people. Initial plans see everyone in the casino holding a champagne toast in the evening at eight o’clock. Other plans to make the casino outstanding have yet to come to light, since officials at Greenbrier are still in the planning stages. The Greenbrier Resort is already ahead of other casinos, however, since the facilities it boats are already luxurious. The hotel complex already includes restaurants, a golf resort and a spa facility, so adding a casino to this development is likely to add to what is already a thriving business. This thriving business has not always been the case for the Greenbrier Resort, however. It was losing money in the millions until it was bought by its current owner in May this year. Previously the Greenbrier Resort had been world famous, even playing host to kings and presidents, but unfortunately nine years ago it lost its five star status. It then began to lose money, until it was rescued by investors just this year. This new development of a tasteful and upmarket casino is very likely to restore the Greenbrier to its former glory. Rep. Jim McDermott (D-WA) introduced today an updated version of the Internet Gambling Regulation and Tax Enforcement Act of 2010, a bill that would ensure that applicable taxes and fees are collected from a regulated Internet gambling industry in order to raise much-needed revenue for federal and state budgets. The most significant change from the previous version, introduced in 2009, is the addition of a provision that allows each State and Tribal Government to be paid six percent of all deposits placed by residents of their jurisdiction with licensed online gambling operators - a change that is expected to generate up to $30 billion over 10 years. Furthermore, the legislation would assign 25 percent of the federal revenue collected on gambling operators - estimated at $42 billion over 10 years - to provide assistance to children in foster care. Bodog.com is proud to announce the addition of more than 20 new casino games to its already extensive offerings. With fun new slots and video poker games like China MegaWild Slots and Face The Ace Video Poker, alongside a slew of specialty games like Jackpot7 and Bingo Scratch, the Bodog.com Casino has something for everyone, across all limits, high and low. With the addition of these new games to Bodog.com's existing game offerings, the ability to play on either the Flash based web-client, downloadable desktop client, and on the road via Bodog Mobile Casino, combined with Bodog's over 15 years of industry experience, competitive bonuses and promotions, and industry leading 24/7/365 customer service, Bodog has all your online gaming needs covered. To experience all that the Bodog Casino has to offer, visit http://casino.bodog.com today. Iron Cross Betting: This involves that you will win on any number except a seven being rolled. It requires a bigger bankroll and you will not want your money exposed for very long, maybe 3 or 4 hits and then take it all down or change your bet to a smaller place 6|8 bet. Here is how to do it. You can see why you would only want it out there on 3 or 4 rolls as the 7 wipes you out, but you can use this to win some money and then turn around and remove all your bets and then place a smaller bet with your winnings like a six dollar 6|8. Statistically, it isn't the greatest betting system with a 3.24% house edge, but Iron cross betting is great for players who like lots of action and want to win frequently.